If you have any questions or want to enquire about dates, use our form to contact Lois & Richard Livett or see their website for more information. Close to The Tower and The Ruin, but further up the hill, is The Folly, an unusual new build encased in native wood with a tower at one end. It’s an impressive and intriguing piece of design, Tardis-like inside, comfortable, well-loved and well maintained, all white walls, gleaming tiles, varnished pine – and big windows to pull in the views. Down a short flight of steps is a big circular living area with a sofa and leather armchair, a cow hide rug on heated floors and doors to terraces front and back so you can chase the sun. Above is the bedroom, a fabulous round space, bright and light, with a high conical roof and a balcony for more views. Who would not want to spend a night here! The bathroom, functional, neutral, is downstairs, the kitchen is a cook’s delight, and the abundant grandeur of the setting, with its backdrop of pine and birch woodland, is neutralised by rolling lawns. Restaurants are nine miles but there’s a nice little wildlife centre with a café a walk away, and the owners provide you with great maps. Once the stillness of 80 acres descends, let the tumbling burn lull you to sleep. 18 November - 17 February. The Folly surpassed our expectations. We had been so looking forward for the past year to our stay and can only say it was wonderful. Lois was so friendly and helpful too. It was a lovely area to explore, unfortunately the weather wasn't always too kind and we got several soakings but had a great time. The Folly was so comfortable to come back to each day. The biscuits and scones made by Lois were much appreciated too. Very high quality accommodation in a beautiful setting. Lois & Richard gave us a very warm and generous welcome and went out of their way to ensure that we were comfortable and that we enjoyed our time staying with them. 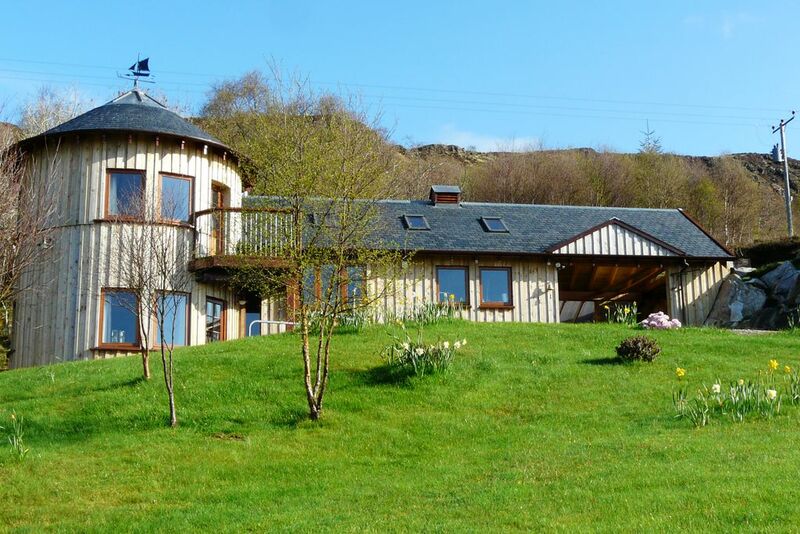 In addition to the wonderful, craftsman built accommodation the grounds are beautiful and provide opportunities for relaxing walks with lovely views of Loch Sunart. We can highly recommend a holiday in these wonderful settings. We stayed at the Folly in September 2018. It is the most amazing place. Such an excellent design with all the inventory and equipment you could wish for. It was spotlessly clean and extremely comfortable. A definite "get away from it all" location with extensive walking and endless wildlife - red deer, hedgehogs, pine martens, seals, otters, sea eagles . . . The local beaches were delightful with clear turquoise sea and very few people! I would not hesitate to recommend this location and accommodation to anyone who is looking for a relaxing and stress free holiday. We have just finished our fourth yearly holiday at Lochside Follies and we are already booked and looking forward to our fifth. It is wonderful to wake up in the morning to be treated to an amazing and ever-changing view across Loch Sunart toward Oronsay and the misty mountains beyond. Wildlife is abundant here and it is easy to lose track of time, spending hours spotting new varieties. Lochside Follies is just perfect. The Folly is beautifully designed and equipped and appears to have been crafted as part of the landscape rather than just built. The picture on our home page of a Pine Marten was snapped by Bob and Marion Corrie, regular visitors to The Folly, this June. A baby Woodpecker was practicing his pecking on the mini mock "Folly" on the bird table then along came Mrs Pine Marten !! Follow the natural paths through our grounds from the shone to the skyline, sitting a while on the rustic seats to enjoy the views. Breath in the smell of wild garlic in the spring and scuff the leaves in the autumn. Just 300mts up the brae is St Columba's well....well it is spout of delicious natural water...cup provided. It is reputed that St Columba used this water to baptise a baby at the nearby Camus nan Geall settlement. Walk a bit further and discover Camus nan Geall....lots of archeological and geological interest here with stunning views as well.